Our "Get Together" basket is perfect for any occasion, especially when you are entertaining your family and friends. 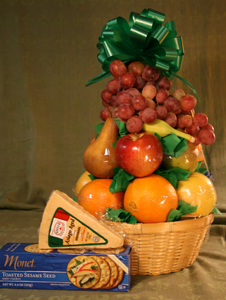 This fruit basket features 20 pieces of fresh, Extra Fancy US #1 fruit, 1 1/2 lbs of grapes, extra sharp cheese and gourmet crackers. The basket is wrapped and finished off with a handmade bow.